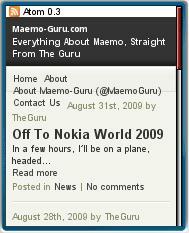 Ricky Cadden, the Symbian Guru, has expanded his coverage to include Nokia’s newest smartphone platform with the launch of Maemo-Guru.com. While Maemo isn’t new having been used in the Nokia N770, N800 and N810 Internet tablets, those were not phones. The next iteration of Maemo devices, the just announced N900, is. Reputedly launching in October the N900 with it’s 3.5 inch touchscreen, WiFi AND 3G radios, slide out QWERY keyboard, huge amount of memory and a Mozilla based browser with Flash support it’s positioned to be Nokia’s next flagship handset. Ricky is no stranger to Maemo, having previously published Tablet-Guru, which he shut down about a year ago citing Nokia’s apparent lack of enthusiasm for the platform. The N900 changes everything so it’s a great time to bring back Tablet-Guru complete with an updated name reflecting that Maemo is not just for tablets anymore. The N900 is an exciting device and I’m looking on getting my hands on one, especially as it supports the oddball 3G bands used by my operator of choice, T-Mobile USA. Nokia’s first Maemo smartphone is going to be a hot topic in the coming weeks and months. Although we have specs and pictures, few people outside of Nokia have actually placed hands on the device. Both Ricky and Maemo-Guru editor Rita El Khoury (dotsisx) will be at Nokia World in Stuttgart this week where the N900 should be the star of the show. I’m counting on Ricky and dotsisx to give us some first hand impressions of the N900’s hardware and Maemo software. The mobile edition of Maemo-Guru is created using WordPress Mobile Pack which does a great job of making the site usable with any mobile browser. This entry was posted in Phonefan Sites and tagged Maemo, N900, NW09 by Dennis Bournique. Bookmark the permalink.